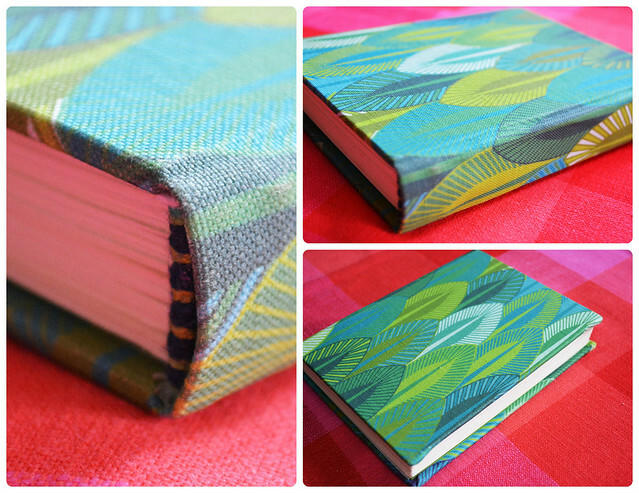 No matter how much I enjoy book binding myself, I will never have the patience or skill of a real book binder. I know, because I’ve watched a couple of them do their thing when I did take a class, and I know myself well enough to just admit it’s not my thing. And that’s totally okay because the journals I’ve made for myself so far have held together just fine, even through traveling, painting and everyday use. 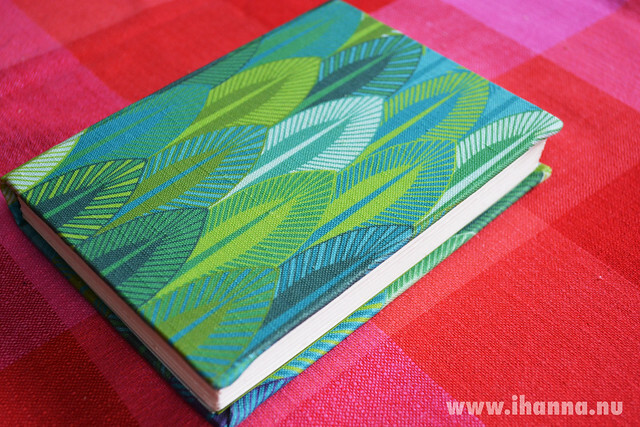 This small green journal was made and shipped from Darwin, Australia, by awesome and very talented Natalie of the Smallest Forest, one of my favorite bloggers ever. It is called Aztec Feathers Handbound journal, and it is just as beautiful as I imagined it to be when I first saw it on her blog. It might have been love at first sight. Just look at the details, like the two-toned headband that is hand-stitched with embroidery floss – so pretty! I love the fabric (Nat’s design too), the vellum-smooth pages called “Bianco Flash”, a creamy, gorgeous paper produced in Italy by Favini Crusinallo. Yum! 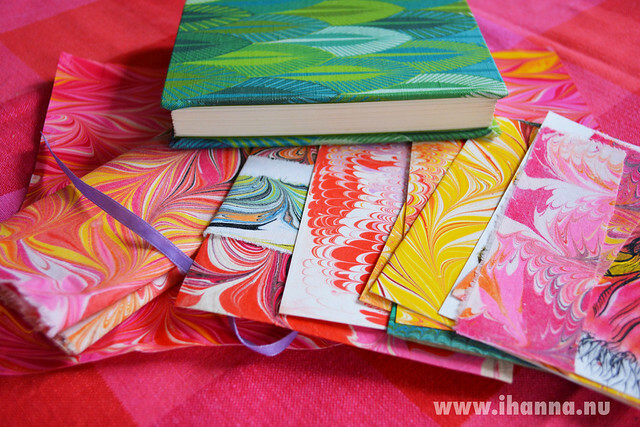 And she sent me some “extras” in the form of beautiful hand marbled papers and fabric, all in my favorite colors! Swoon, right? I have way to many empty notebooks waiting for me, but I am still happy that I got this one as a gift for myself. A girl needs her notebook fix, right? I hope you know that a notebook is a creative girl’s best friend! So get yourself a pretty notebook, and start recording those ideas that pop into your head! Maybe even a handmade one (here is Natalie’s etsy shop)! I’m off to fill another page, a sketch for my next embroidery. This entry was posted in A Creative Life, Notebooks and tagged idea book, new notebook, self love. Bookmark the permalink. Wow, it really is a gorgeous journal! I love the feeling that comes with getting a brand new notebook and imagining what you’re going to use it for and what it’s going to look like someday.